Many people still think of video games as the province of children, precisely because, at the moment of their mass-market origins in the 1970s, they were genuinely kids’ stuff. A December 1980 article in The New York Times Magazine reported that electronics was transforming the toy industry the same way that plastics had 30 years earlier. The article barely differentiated the video games made by Atari, Coleco and others from the electronic toys made by Texas Instruments and Milton Bradley, including the once-omnipresent color-coded memory game Simon. Over the next three decades, the two industries went their separate ways. Soon enough, no one would confuse a Furby or a Tickle Me Elmo with a video game. Now, however, toys and video games are merging again, led by Activision’s Skylanders, a billion-dollar franchise that combines toy figures with a virtual world. Skylanders is currently both the highest-grossing video game of 2013 and the top-grossing action-figure line, according to the company. The third iteration of the game, Skylanders: Swap Force, is scheduled to arrive this fall. But new competitors are on the horizon, including Disney Infinity, a similar blend of toys and video games, to be released on Sunday, that feels more exciting and inventive than its corporate parent’s disappointing slate of movies this summer. The divide between toys and video games has, in recent years, been defined by the presence of a screen: If something had one, it was a video game. If it didn’t, it was a toy. That distinction has eroded as video game screens have extended themselves into our living rooms. We don’t have Star Trek holodecks in our basements (yet), but the line between the virtual and the corporeal is becoming fuzzier. Part of the astonishment that greeted Nintendo’s Wii and Microsoft’s Kinect the first time people played them was the sensation that a video game had reached beyond the television and into the physical space around them. Video games had always been tactile, but motion controls introduced a feeling of virtual reality that transcended what button-pressing and joystick-wielding could do. Motion controls have receded in popularity of late, replaced by a different living room presence: Skylanders and the mode of play it made popular. The genius of this series, introduced in 2011, is that it combines the virtual appeal of video games with the material attractions of toys. This new way to play is as much an intersection of physicality and virtuality as the Wii was. The characters that players control in Skylanders, as well as in Disney Infinity, are toy figures. When the toys are placed on a platform — a “Portal of Power,” in the case of Skylanders — the characters come to life on the television screen. Within minutes of encountering Skylanders: Giants, last year’s blockbuster, my 3-year-old daughter grasped the delight of swapping a giant, a dragon and an eagle on the portal and watching their video game adventures. The Disney Infinity starter pack, which costs $75 and will work with the major video game platforms, has three toy figures: Mr. Incredible from “The Incredibles,” Sulley from “Monsters Inc.” and “Monsters University,” and Jack Sparrow from the “Pirates of the Caribbean” movies. (There is, alas, no George Stephanopoulos figurine.) 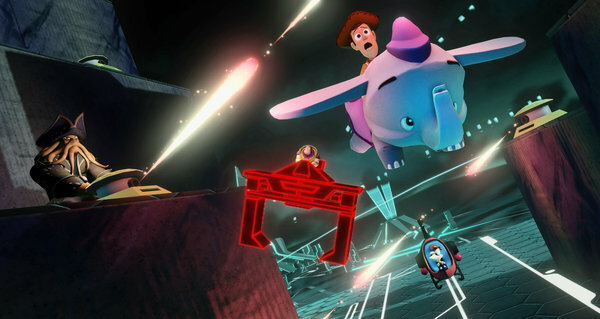 Players can buy more action figures — “interactive game pieces,” Mr. Vignocchi called them — from those franchises, as well as from the universes of “Cars” and “The Lone Ranger.” By October, figures from “Toy Story,” “Phineas and Ferb,” “Tangled,” “Fantasia” and “Wreck-It Ralph” will be available. The physicality of the toys makes palatable one element of video games that players sometimes find annoying: being forced to spend additional money to unlock certain characters and special powers and locations. Paying $15 to add Mrs. Incredible to your “Incredibles” video game sounds outrageous. But when she comes in the form of a toy figure? Well, it’s at least slightly less ridiculous. Disney is not the only entertainment giant trying to encroach on Skylanders’ turf. In September, Rovio and Hasbro will introduce their collaboration on the mobile game Angry Birds Star Wars II. The game, built by Rovio, can be supplemented with Hasbro’s Telepods: physical play sets that can also be used to inject new characters. “Today’s kids expect to be able to move between physical and digital play very seamlessly,” said John A. Frascotti, Hasbro’s chief marketing officer. But perhaps the most novel experiment in the merging of physical and digital play comes from an independent designer, Douglas Wilson. Mr. Wilson’s Johann Sebastian Joust beat the first Skylanders game, among other nominees, for the Innovation Award at the 2012 Game Developers Choice Awards. Joust requires a PlayStation 3 and Sony’s motion-sensitive Move controllers to play, but it eliminates the use of a screen entirely. The game, set to the music of Bach, is a living room competition to determine who can hold a Move controller steady for the longest while trying to smack other players’ controllers.Is it a sport? A video game? A toy? All three? Or something else entirely?